Today I am announcing that the Australian Government is providing $150,000 to fund a further scholarships program that aims to facilitate training for people from Indigenous and culturally diverse backgrounds to deliver family dispute resolution services. In particular, culturally appropriate services for separated families. A similar scholarships program ran between 2011-2014 for Culturally and Linguistically Diverse (CALD) and Aboriginal and Torres Strait Islander people who wished to obtain a Graduate Diploma in Family Dispute Resolution. The scope of the new scholarships program has been broadened to cover training in post separation service delivery work. This not only covers family dispute resolution, but also family and relationship counselling, children’s contact services and community development. It is well known that people from Indigenous and CALD backgrounds face substantial barriers to accessing family law post separation services in Australia. These scholarships will build and enhance the skills for professionals who understand both the cultural background of different families and the family law system. They are pivotal in bridging current gaps in access to these services. This initiative supports the Australian Government’s ongoing commitment to improving access to justice for people from Indigenous and CALD backgrounds. Family & Relationship Services Australia will administer the scholarship program. 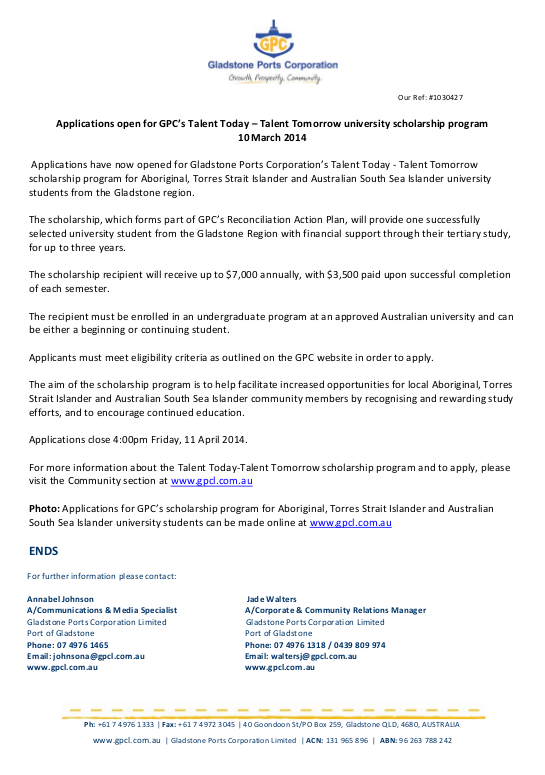 Scholarship applications are now open and will close on 12 May 2015. Successful applicants will be notified in early June 2015 for courses commencing in the second half of 2015. Applications for a second round of scholarship, for eligible courses commencing in 2016, will open in November 2015. For more information please contact Family & Relationship Services Australia. Scholarship available at the Dispute Resolution Branch (DRB). We would like to invite young people between the ages of 21 and 30 years old to apply for The Jack Cranstoun Scholarship. One of the aims of the scholarship is to encourage young people to train as mediators. If you have someone that you know in this age group who is interested in mediation and dispute resolution please feel free to forward on this email. Attached is some information about the scholarship and how to apply. If you need further information, please contact Janet Barnes on 3239 6277. Please Contact Training for inquiries. These scholarships were originally funded non-recurrently through CMH and transferred to MHAODB in 12-13. Not all the scholarships were able to be taken up this year so Griffith is now offering the opportunity to apply again for 2014. I am pleased to advise applications are now being accepted for the 2014 Pearl Duncan Teaching Scholarships and I welcome your assistance in sharing information through your networks. These scholarships are available to Aboriginal and Torres Strait Islander Queenslanders who aspire to become teachers in Queensland schools. The scholarship provides financial assistance of up to $20,000 over four years to recipients studying an approved an initial teacher education program (full-time) in a Queensland university. It also provides the recipient with the opportunity to secure permanent employment as a teacher in a Queensland state school following graduation. * Post-school category – where all others unable to apply in any of the above categories can apply. Applications close on Monday 9 December 2013. A Fact Sheet for is attached for your information. Detailed information about the Pearl Duncan Teaching Scholarships is available from the Make a Difference. Teach website at www.teach.qld.gov.au. Should you require further information, please contact Wendy Kirby, Project Officer, Workforce Initiatives, by email scholarships@dete.qld.gov.au or by telephone 3237 0689 if you have any questions. I am pleased to advise that applications for a scholarship through the 2013 Australian South Sea Islander Community Foundation, Scholarship program are now open. Please find attached a copy of the guidelines and application form for 2013. The closing date for applications is Friday 8 February. If you have any questions related to this matter please including if you are having difficulties accessing the attached document contact Adam Ismail, Policy Officer, Strategic Projects and Community Relations on 3224 7992.